Relocating has its ups and downs, but when it's relocating overseas, there are a lot more ups and a lot more downs. 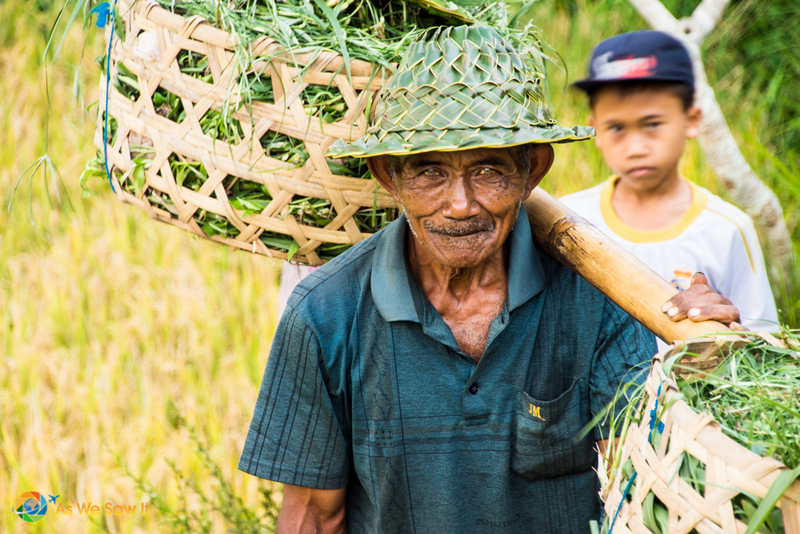 I already shared a few of the cultural differences I encountered in Bali, but that wasn't all I learned there. Here are 3 more lessons I received. I haven't done any laundry or cleaning since I arrived, and neither has Dan. Every day, two women come early in the morning to wash last night's dishes, sweep and mop the floor, clean our bathrooms, change the linens, do the windows, and generally make the place livable. We also have a gardener, who also comes morning and evening to maintain the pool and remove any leaves or flowers that may have fallen from the frangipani trees overhead. Although our landlord includes these services, others hire full-time help for as little as $200 a month. It's true what they say: Labor is cheap overseas. Our maids take our clothes and linens to a laundry service whenever we ask. We can get a week's worth of laundry washed and folded for about $5. When I needed a cleaning, we were shocked to discover how cheap dental work is, I was pleased to see my clinic had Western facilities and fastidious hygiene practices. I struck up a conversation with an Australian in the waiting room and soon learned why so many fly to Bali when they need dental work: His wife was getting a tooth implant for $200. Attitude adjustment time. At first we thought we were taking advantage of the locals, but after living here for a bit we've changed our minds. The salaries are what they are used to, what they have come to expect, and they think it's a fair price. Consider the plight of a woman I read. She was paid a Western maid's salary for years and became accustomed to it. When her employer left, she refused to work for less, and has been unemployed ever since. So who's doing who a disservice? Cheap labor? I could judge it by American standards and say, yes. By local standards, not at all. It's fairly-priced labor, and it works. Taksi? Yes, please. Indonesian traffic is a nightmare. The easiest way to get around Bali's tourist areas (Kuta, Seminyak, Sanur, etc. ), is to flag down a Blue Bird Taksi. The first two kilometers cost just 5000 Indonesian rupiah (IDR), which is about 60 cents. Our last trip to the grocery store cost 47,000 IDR ($5), due not so much to the distance as to the traffic. 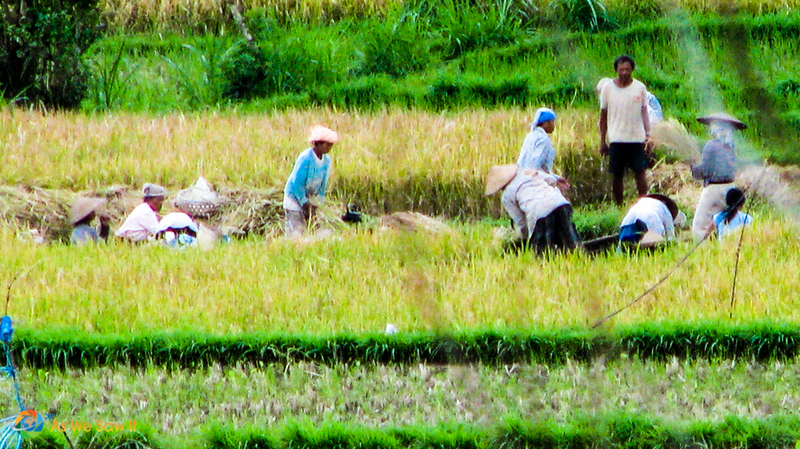 Traffic in Bali is … er, different. There are as many motorcycles/motorbikes as cars on the roads and the bikers weave between and around cars with abandon. If there's a way to keep going, they'll find it … even if it means going up onto the sidewalk to do it. Drivers are no better. On the major airport bypass road, which is two lanes in each direction, you'll often see cars four wide during rush hour. It seems no one observes the lines in the road and the adjacent gravel shoulders frequently become another lane for cars and cycles. Ignore stop signs if traffic is light. As to stop lights: Apparently if they haven't started moving, you can keep going. If you must stop before you get through an intersection, they'll pull up to your car or bike and wait or (if they can) drive around you. If you see a driver waiting to enter traffic, don't stop to wave him in; he'll have no idea what you're trying to do. Rather, let him find his own way. As soon as he sees a meter or two of space between cars, he'll pull in just fine on his own. For all the apparent confusion, Balinese are decidedly calm drivers. Balinese don't honk, they beep. Beep, I’m coming around a blind corner. Beep, taksi available, do you need a ride? Beep, heads up, I'm driving around you. On those rare occasions when I've heard an impatient Honk, it's always been a Westerner at the wheel. Not quite sure what to make of that! We finally tired of relying on Blue Bird Taksi and rented a motorbike. The cost was 700,000 IDR per month, which comes to about $75. Interestingly, they didn't ask for a deposit or driver's license. They just Dan's asked for his passport number, our villa's phone number, and the first month payment up front. We are now learning how to go with the flow of traffic.That means it's OK to drive between cars anytime you want, just as long as your mirrors will clear the space. I'm not sure we'll ever feel comfortable driving on the sidewalk, though. We had to stop too suddenly last week and took a spill. God was good: There was no oncoming traffic. Witnesses ran to fuss over us. They wanted to make sure we were okay and the bike had survived. Thankfully we don't have any permanent injuries, just a few bruises and a couple of skinned knees and elbows. The bike is fine, too. Fortunately, if we'd had to replace it, we'd have had to pay only 15,000,000 IDR for a new one. Yes, motorcycles are ridiculously cheap to buy here. That is one adjustment that's easy to make! bug you, this aint the place for you. But overall if you don’t swaet the small stuff, this is a great spot on the planet to be. Totally agree, Andy. Bali will always have a special place in our hearts. 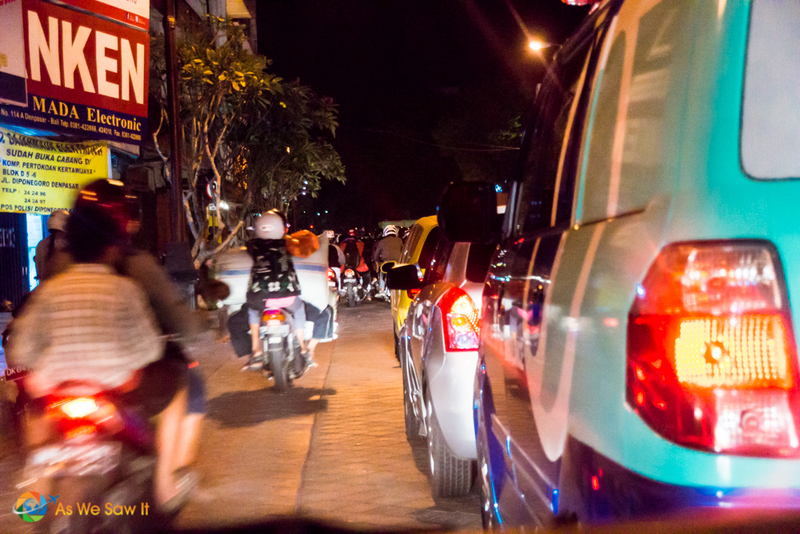 I’ve only been to Bali once, but the traffic situation left a lasting impression on me! You guys are really brave to navigate it with a motorbike, without the safety of the car structure to cushion you from any impacts. Stay safe! Haha – you know what, they say that the traffic in Jakarta is worse. No bikes for us there!